This page provides a brief answer... it assumes that you know what Natural Language Generation is. If this is not the case, see this introductory information. The KPML system offers a robust, mature platform for large-scale grammar engineering that is particularly oriented to multilingual grammar development and generation. It is particularly targetted at providing resources for realistic but broad-coverage generation applications, where both flexibility of expression and speed of generation are at issue—for example in online webpage generation or spoken dialogue. 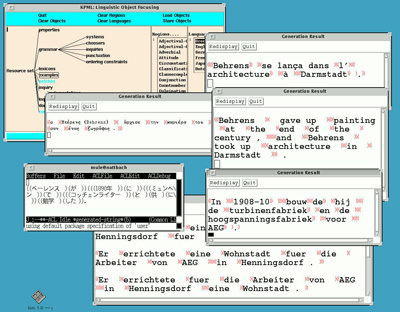 KPML is also used extensively in multilingual text generation research and for teaching. The KPML system is an ongoing development drawing on over a decade of experience in large-scale grammar development work for natural language generation (NLG). It is now maintained at the University of Bremen, Faculty of Linguistics and Literature. The system is a graphically-based development environment for the construction, maintenance, and use of large-scale grammars written with the framework of Systemic-Functional Linguistics (SFL). SFL is a grammatical approach widespread in both use and influence within the field of NLG that gives equal weight to linguistic phenomena which are crucial for the construction of adequate texts but which do not belong to the propositional content, or semantics viewed narrowly. This has been a central area of concern in several long-term generation projects for many years. Grammars have been developed using KPML for a variety of languages including English, German, Dutch, Chinese, Spanish, Russian, Bulgarian, and Czech. Many of these grammars are freely available for further research and development work within the NLG community. The English grammar is the very large Nigel grammar under development since the early 1980s in the Penman project at USC/ISI, Los Angeles. Ehud Reiter and Robert Dale (2000) Building Natural Language Generation Systems. Cambridge University Press, Cambridge, U.K.
Christian M. I. M. Matthiessen and John A. Bateman. (1991) Text generation and systemic-functional linguistics: experiences from English and Japanese. Frances Pinter Publishers and St. Martin's Press, London and New York. John A. Bateman. (1997) 'Enabling technology for multilingual natural language generation: the KPML development environment'. Journal of Natural Language Engineering, 3(1):15--55. Some basic tutorials are available on the main KPML page.